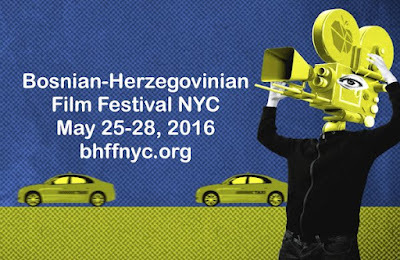 The Bosnian-Herzegovinian Film Festival is one of the best kept secrets of the New York film year. It’s a festival many people ave not heard of, but is a festival that once you attend is going to be one you’ll always want to go back to. Joe Bendel had been talking the festival up ever since I met him. I “yea, yeaed” him for a while and then two years ago I really looked at the festival and realized that they were showing some great films. I got a couple of screeners and wrote some stuff up. Then last year my schedule matched up to the festival and I actually attended the festival. What a freaking good time I had. Sitting in the bar next to the old Tribeca Cinemas waiting for the screening, I was joined by Joe and tried to shoot the breeze but people he had met at the festival over the years kept coming over to him to say hi. Then chaffing dishes were brought out and we were treated to a spread of food. I’m not saying this happens all the time, but as someone walking in for the first time it was something really nice. Actually there wasn’t much time to sit around before we were shuttled into the theater for our movie. Yes there was introductions, speeches and Q&A’s but it was more like old home week with a friendly feeling that we were all one big family. It’s a feeling that I’ve only get at the New York Asian Film Festival, which is why I keep going back to that festival, and why I will keep going back to this one. The festival this year starts Wednesday and runs through Saturday. Yes I know Its memorial day weekend, but that’s no reason not to go. They are running a bunch of good films and you should go see them. Reviews will be coming of all the features except SOUL TRAIN because I can’t get to it. However everything else should be reviewed. As I said the festival starts Wednesday and you must go because it will become your new favorite festival. For tickets and more information on the various programs go to the festival website. The screenings are called programs because they don’t just run features, they run shorts with them, which is just an awesome thing to do.